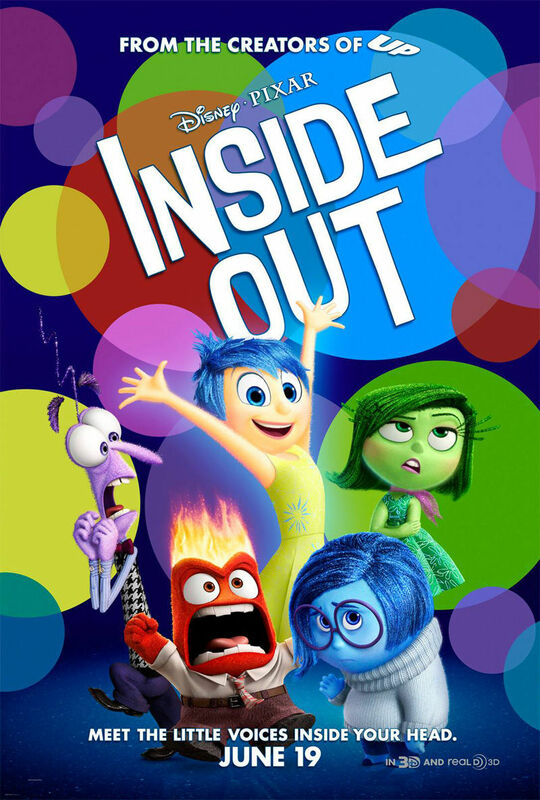 Inside Out (2015): Directed by Pete Docter and Ronaldo Del Carmen. Written by Pete Docter, Meg LeFauve, and Josh Cooley, from a story by Pete Docter and Ronaldo Del Carmen. Additional dialogue by Amy Poehler and Bill Hader. Starring: Amy Poehler, Phyllis Smith, Bill Hader, Mindy Kaling, Lewis Black, and Richard Kind. Rated PG for mild thematic elements and some action. Running time: 94 minutes. By portraying characters that are in fact human emotions personified, one invites the question: how much does one alter these characters beyond their namesakes? Stray too much and you risk losing each character’s essence. Stray too little and your characters become stale and predictable. Thankfully Pixar has maintained a delightful and near-effortless balance between these two extremes in their latest film, their best since 2010’s Toy Story 3. It’s a story both novel and familiar, detailing the difficulties of a young girl named Riley adjusting to a new town and school. The added gimmick presents her emotions as living, vibrant personalities residing within her consciousness. And so, as I’m sure the media blitz has made you aware, we have Joy, Sadness, Anger, Disgust, and Fear, all fighting for the helm of Riley’s mind even before her fateful move. Each of them is uniquely colored, uniquely shaped, and uniquely voiced. And yet they don’t stay tethered to their namesakes. Their personalities prove multifaceted, even paradoxical. Such complexity suggests great sophistication on the part of the filmmakers, who understand how emotions can overlap and redefine themselves. Directors Pete Docter and Ronaldo Del Carmen have had a hell of a time balancing the abstract environs of the Emotions themselves and the reality of the young girl to whom they belong. The directors employ skillful cross-cutting so that we may trace the causal flow of one world to the next. This becomes particularly evident when Riley fully contemplates the loneliness of being uprooted from Minnesota—in synchronicity, Joy and Sadness are whisked far from Headquarters, and must find a way back. This leaves Anger, Fear, and Disgust alone to rule the roost, a perfect image of Riley’s mental state. Specificity of design is key to maintaining the film’s psychological integrity. Universal struggles feel massively epic within the Emotions’ mind universe. From the intricacies of dream programming to the physical representations of memories as colorful marbles, each aspect of Riley’s mind has been thought out and painstakingly constructed. Look at how the film deals with the daunting exposition that explains each Emotion and how they make Riley who she is. Note how the film introduces each concept through a corresponding image, as when Disgust is introduced once Riley encounters broccoli for the first time. The film does allow for some verbal exposition, but there’s always a visual aid (thanks to the brilliant animation) to keep things grounded. Inside Out manages the impressive feat of being vibrantly alive and visually stimulating for audiences of any age, yet constantly deliberate in its creations. “Trains of thought” roam the wide mental landscape, but it’s never precisely known when they’ll leave their stations. The “Subconscious” is a dank dungeon home to broccoli, basement doors, and of course, clowns. Most humorously, mind workers continue to send a commercial jingle to Headquarters for no discernible reason other than their own amusement. Pixar has spared no expense in fleshing out their mental landscape in agonizing detail. If you want to (and I hope you will), you can trace each plot development to Riley’s psychological evolution. The film also stays grounded thanks to the dynamic between Joy and Sadness. Despite their names, it’s Sadness whose perpetual sluggishness leads to black comedic gold. And it’s Joy who ends up saying and doing all those things that make us cringe, mistakenly believing Riley’s salvation lies in a world without Sadness. Poehler suggests the madness of one who continually manufactures happiness, while Phyllis Smith infuses Sadness with surprising wisdom and experience. When they’re joined by Riley’s childhood imaginary friend Bing Bong (looking and sounding like the result of Dr. Seuss and Charles Dickens collaboration), it taps into a new poignant territory as Riley teeters on the edge of childhood and adolescence. Hopefully I’m not making this sound like a pure intellectual exercise, because it never feels that way. I’m amazed at the searing power of Pixar’s images: the sight of “personality islands” plunging into the abyss of forgotten memory, or the portrait of a family embracing one another while sitting on a tree branch. Then there’s the wrenching shot of Joy clasping herself in utter despair at her lowest point. These are images you’ll have a hard time expunging from your memory, so be warned. But never fear; while the film explores the uncomfortable truths of depression and the dangers of emotional monomania, a triumphant and emotionally cathartic conclusion awaits. Pixar has a knack for acknowledging hard truths, while ensuring we know that we don’t have to face them alone. We need comedy, we need tragedy, and everything in between. And more films like this one, while we’re at it.